Probiotic 5M™ is a probiotic powder with children in mind. Probiotics are live organisms (which need to be abundant) in your intestines to support assimilation of nutrients and infection prevention. Probiotic 5M™ has both of the most important probiotics that you need! Lactobacilius acidophilus (providing 500 million culture forming units) and Bifidobacterium Bifidum (500 million culture forming units) which can replenish and even enhance the correct quality and quantity of healthy bacteria lost. Biotin is essential for carbohydrate metabolism and the synthesis of fatty acids. It also is involved in the transformation of amino acids into protein. 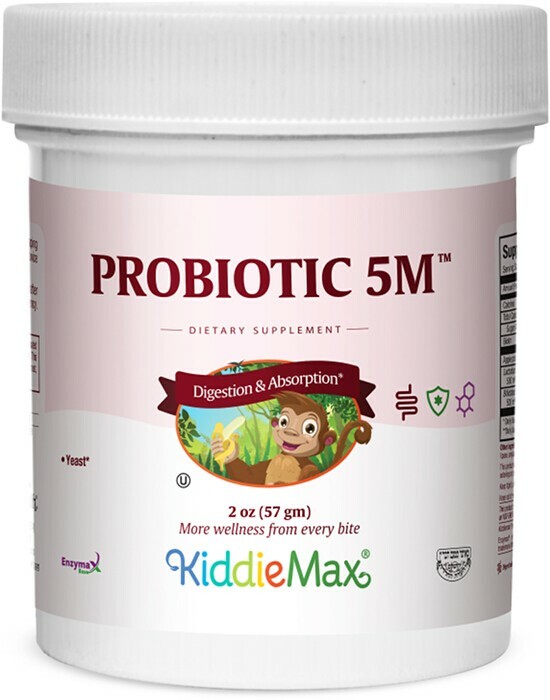 When it’s time for a probiotic for your children, ask for Probiotic 5M™! Mix one (1) heaping scoop with 4 oz. of water upon arising and bedtime, or as directed. Other Ingredients: Mannitol, silicon dioxide, Enzymax® (calcium carbonate, bromelain, papain, lipase, amylase, protease, silica), sucralose, dextrose, maltodextrin, sodium citrate, acacia gum. This product contains no animal products, soy, wheat, salt, gluten, milk, artificial flavors, colorings or preservatives. My younger brother has to take antibiotics very often. Mother bought the Probiotic 5M and now he does not suffer with diarrhea.